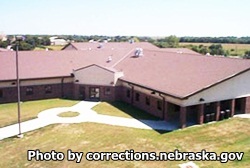 Nebraska Correctional Center for Women is located in York Nebraska. It is responsible for housing minimum, medium, and maximum custody female inmates. Additionally, this facility performs court ordered evaluations, and houses safe keeper inmates from the county jails. Nebraska Correctional Center for Women can house up to 275 offenders. Furthermore, this facility is responsible for the intake, diagnostic, and evaluation of all female offenders in the state. During an inmates first 30 days of incarceration at Nebraska Correctional Center for Women they will undergo an orientation program designed to evaluate physically and mentally, treat any pre existing medical conditions, and teach the inmate about the various programs available to them during their incarceration. Programs include adult basic education, GED courses, substance abuse programs, culinary vocational classes, pre-release programs, and even a program that allows the offender to work with dogs. All visitors will only be processed for the first hour of a visiting time, after that visitor processing will cease.